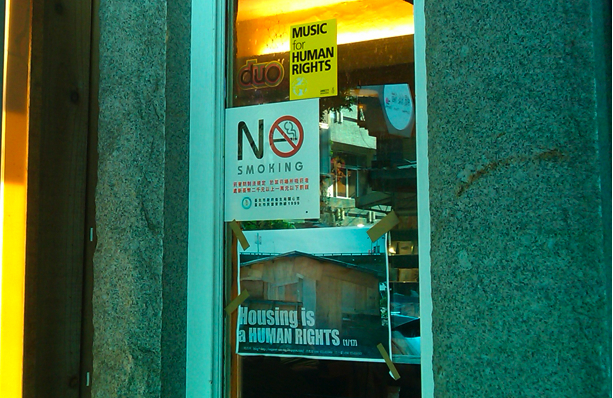 dAb's blog: [雜感] What The Hell is Human Rights? 「Housing is a Human Right。」很顯然地，這在用句遣辭的語氣上一丁點兒也無法讓人感同身受，反而是根本地凸顯了張貼公告的這群人 他們的無知、欠缺思慮與驕縱。如果在任何地方搭建住居是我們的權利，那麼土地以及土地上的其他生命難道就沒有反對人類何處住居的權利？ Where the hell is Non-Human Rights? 我們反對你們， 當然也就變成是我們的Rights， 那你們又該如何說服我們？ 當妳們決定在電腦軟體當中將這幾個字 Key上海報的時候， 有沒有想過妳們所強調的Rights 是否影響到了哪些其他（The Others Rights）? Listed below are links to blogs that reference this entry: [雜感] What The Hell is Human Rights?. I simply want to tell you that I'm new to blogging and site-building and honestly savored you're blog site. Almost certainly I’m planning to bookmark your blog post . You really come with wonderful article content. Appreciate it for sharing with us your blog. hey there and thank you for your info – I’ve certainly picked up something new from right here. I did however expertise several technical issues using this site, as I experienced to reload the site a lot of times previous to I could get it to load correctly. I had been wondering if your web host is OK? Not that I am complaining, but slow loading instances times will often affect your placement in google and could damage your high quality score if ads and marketing with Adwords. Anyway I’m adding this RSS to my e-mail and could look out for much more of your respective fascinating content. Make sure you update this again very soon.. I simply had to thank you so much yet again. I am not sure what I could possibly have carried out without the entire basics contributed by you over that situation. It previously was a distressing situation for me personally, but spending time with your professional way you treated the issue took me to leap for fulfillment. Extremely happier for your service and even pray you really know what an amazing job you have been undertaking training the mediocre ones thru a web site. Most likely you've never come across any of us. I am not positive where you're getting your info, however great topic. I must spend some time finding out much more or working out more. Thanks for magnificent information I used to be on the lookout for this info for my mission. I’m not sure where you're getting your information, but good topic. I needs to spend some time learning more or understanding more. Thanks for excellent information I was looking for this info for my mission. Great post. I was checking continuously this blog and I'm impressed! Very helpful info specially the last part :) I care for such info a lot. I was looking for this certain info for a long time. Thank you and good luck. hello!,I like your writing very a lot! share we keep up a correspondence extra approximately your post on AOL? I need an expert on this space to solve my problem. May be that is you! Looking ahead to see you. I¡¦m now not sure the place you're getting your information, however great topic. I must spend some time learning more or figuring out more. Thank you for wonderful info I was looking for this info for my mission. Great remarkable issues here. I¡¦m very glad to peer your post. Thank you a lot and i'm taking a look forward to touch you. Will you kindly drop me a mail? Somebody necessarily lend a hand to make severely articles I might state. This is the very first time I frequented your website page and so far? I amazed with the research you made to create this actual post amazing. Wonderful activity! I needed to post you a very little note so as to give many thanks yet again just for the beautiful tactics you have discussed on this page. It's simply surprisingly open-handed of you to give extensively just what many of us might have made available as an ebook to end up making some profit for their own end, mostly considering that you might have tried it if you ever decided. Those strategies in addition acted to provide a fantastic way to comprehend other people online have similar desire really like mine to grasp many more on the subject of this issue. I know there are numerous more enjoyable sessions up front for those who start reading your website. Thank you for every other informative site. The place else may I get that type of information written in such a perfect manner? I have a venture that I am simply now running on, and I've been on the glance out for such information. Excellent website. Plenty of helpful information here. I am sending it to a few buddies ans additionally sharing in delicious. And obviously, thank you in your effort! Excellent web site. Plenty of helpful info here. I¡¦m sending it to several pals ans also sharing in delicious. And certainly, thank you on your effort! of course like your website however you need to test the spelling on several of your posts. Many of them are rife with spelling issues and I to find it very troublesome to inform the truth however I¡¦ll definitely come back again. hey there and thank you for your info – I’ve definitely picked up something new from right here. I did however expertise several technical points using this website, since I experienced to reload the site a lot of times previous to I could get it to load correctly. I had been wondering if your web host is OK? Not that I'm complaining, but sluggish loading instances times will sometimes affect your placement in google and can damage your high quality score if advertising and marketing with Adwords. Anyway I’m adding this RSS to my email and could look out for a lot more of your respective interesting content. Ensure that you update this again soon..
you're in reality a just right webmaster. The website loading velocity is amazing. It kind of feels that you're doing any distinctive trick. In addition, The contents are masterpiece. you have performed a fantastic task on this topic! hello there and thank you for your information – I’ve definitely picked up anything new from right here. I did however expertise a few technical issues using this website, since I experienced to reload the web site many times previous to I could get it to load properly. I had been wondering if your web host is OK? Not that I'm complaining, but slow loading instances times will very frequently affect your placement in google and can damage your high quality score if ads and marketing with Adwords. Well I am adding this RSS to my e-mail and can look out for much more of your respective exciting content. Ensure that you update this again soon.. Very efficiently written story. It will be supportive to everyone who employess it, as well as myself. Keep doing what you are doing - can'r wait to read more posts. Your style is unique in comparison to other people I have read stuff from. I appreciate you for posting when you have the opportunity, Guess I will just bookmark this site. Whats Going down i am new to this, I stumbled upon this I've discovered It positively useful and it has helped me out loads. I'm hoping to contribute & assist different users like its aided me. Great job. wonderful issues altogether, you just gained a new reader. What would you recommend about your submit that you just made some days in the past? Any sure? I not to mention my guys came taking note of the great solutions found on your web blog and instantly came up with an awful suspicion I had not expressed respect to you for those strategies. All the young men are already for that reason excited to read through all of them and already have simply been using those things. Many thanks for being very kind and for utilizing variety of smart themes most people are really desperate to learn about. Our own sincere regret for not expressing appreciation to sooner. you are truly a excellent webmaster. The website loading speed is amazing. It sort of feels that you are doing any unique trick. In addition, The contents are masterwork. you've performed a great process on this subject! I want to convey my respect for your kindness giving support to women who really need help on your concept. Your special dedication to getting the message throughout has been unbelievably informative and has consistently made regular people much like me to get to their aims. Your personal warm and helpful report signifies much a person like me and much more to my colleagues. Thank you; from each one of us. Wow, incredible blog format! How lengthy have you been blogging for? you made running a blog look easy. The whole glance of your web site is great, let alone the content material! I have read a few just right stuff here. Definitely worth bookmarking for revisiting. I surprise how a lot effort you put to create any such great informative web site. Hello, Neat post. There's an issue along with your web site in internet explorer, may check this¡K IE nonetheless is the marketplace leader and a large part of other folks will pass over your magnificent writing because of this problem. I am now not certain where you're getting your information, but great topic. I must spend some time finding out more or understanding more. Thanks for great info I was looking for this info for my mission. I wish to point out my love for your kind-heartedness giving support to folks who really want assistance with in this area of interest. Your very own commitment to getting the solution around ended up being wonderfully helpful and has always helped women just like me to get to their goals. Your new informative help signifies so much to me and additionally to my office colleagues. Thanks a ton; from everyone of us. Hi there! This article could not be written any better! Reading through this article reminds me of my previous roommate! He continually kept preaching about this. I'll forward this post to him. Fairly certain he will have a great read. Many thanks for sharing! You actually make it seem so easy with your presentation however I to find this topic to be really something which I feel I might by no means understand. It seems too complex and very wide for me. I'm having a look ahead for your next submit, I will try to get the hold of it! I'm just commenting to make you know of the great encounter my cousin's princess gained reading yuor web blog. She came to find plenty of issues, including what it is like to have an excellent teaching mindset to let many others without problems thoroughly grasp some tortuous subject matter. You really surpassed people's expected results. Thanks for supplying the productive, safe, informative as well as easy thoughts on the topic to Evelyn. It is the best time to make some plans for the future and it is time to be happy. I've read this post and if I could I wish to suggest you few interesting things or suggestions. Perhaps you can write next articles referring to this article. I desire to read even more things about it! Hi, Neat post. There's a problem along with your web site in internet explorer, would check this¡K IE nonetheless is the marketplace leader and a huge portion of other people will pass over your great writing due to this problem. Wow! This could be one particular of the most helpful blogs We have ever arrive across on this subject. Basically Fantastic. I'm also an expert in this topic therefore I can understand your effort. Wow! This could be one particular of the most useful blogs We've ever arrive across on this subject. Basically Wonderful. I am also a specialist in this topic so I can understand your hard work. Its like you read my mind! You seem to know so much about this, like you wrote the book in it or something. I think that you could do with a few pics to drive the message home a little bit, but other than that, this is excellent blog. An excellent read. I'll certainly be back. fantastic issues altogether, you just gained a new reader. What would you recommend in regards to your submit that you simply made a few days ago? Any certain? I would like to thank you for the efforts you've put in writing this site. I'm hoping the same high-grade web site post from you in the upcoming also. In fact your creative writing abilities has encouraged me to get my own website now. Actually the blogging is spreading its wings rapidly. Your write up is a great example of it. I like the valuable information you provide in your articles. I will bookmark your blog and check again here frequently. I'm quite certain I will learn lots of new stuff right here! Good luck for the next! I¡¦m not certain where you are getting your information, but great topic. I must spend some time finding out more or understanding more. Thank you for great information I was looking for this information for my mission. I enjoy you because of every one of your efforts on this website. Gloria really likes carrying out investigations and it's really simple to grasp why. Most of us notice all about the powerful ways you provide rewarding ideas through the web site and even attract contribution from visitors about this subject matter so our own princess is undoubtedly understanding a great deal. Take advantage of the rest of the year. Your doing a glorious job. games on your phone can really suffice your casino gaming needs. Hiya, I'm really glad I have found this information. Today bloggers publish just about gossips and net and this is really annoying. A good blog with interesting content, this is what I need. Thank you for keeping this web site, I will be visiting it. Do you do newsletters? Cant find it. naturally like your web site but you have to check the spelling on several of your posts. A number of them are rife with spelling issues and I in finding it very bothersome to tell the reality on the other hand I will certainly come back again. Wow, marvelous weblog structure! How lengthy have you been blogging for? you made running a blog glance easy. The overall look of your web site is magnificent, let alone the content! Thank you, I have recently been looking for info about this subject for ages and yours is the greatest I have discovered so far. However, what in regards to the conclusion? Are you sure about the supply? great post, very informative. I wonder why the opposite experts of this sector do not notice this. You must continue your writing. I'm confident, you have a huge readers' base already! Excellent post. I was checking continuously this blog and I'm impressed! Extremely useful info particularly the last part :) I care for such info much. I was seeking this particular information for a long time. Thank you and good luck. You could definitely see your expertise within the work you write. The sector hopes for more passionate writers such as you who aren't afraid to mention how they believe. All the time follow your heart. I have read a few good stuff here. Definitely value bookmarking for revisiting. I wonder how much attempt you set to make any such great informative site. Fantastic website. Plenty of useful info here. I¡¦m sending it to some buddies ans also sharing in delicious. And certainly, thanks on your effort! I was just searching for this info for a while. After 6 hours of continuous Googleing, at last I got it in your website. I wonder what is the lack of Google strategy that don't rank this kind of informative sites in top of the list. Normally the top web sites are full of garbage. Hey there, You've done a great job. I will definitely digg it and personally suggest to my friends. I'm sure they will be benefited from this website. hello there and thank you for your info – I have certainly picked up anything new from right here. I did however expertise several technical issues using this site, since I experienced to reload the web site lots of times previous to I could get it to load properly. I had been wondering if your web host is OK? Not that I'm complaining, but slow loading instances times will very frequently affect your placement in google and could damage your high quality score if advertising and marketing with Adwords. Anyway I’m adding this RSS to my email and could look out for a lot more of your respective exciting content. Ensure that you update this again soon.. Excellent post. I was checking continuously this blog and I am impressed! Extremely helpful info particularly the last part :) I care for such info a lot. I was seeking this particular information for a very long time. Thank you and good luck. Thank you a lot for sharing this with all people you really recognize what you're speaking about! Bookmarked. Please also consult with my web site =). We could have a link change agreement among us! Whats Going down i'm new to this, I stumbled upon this I've found It positively useful and it has aided me out loads. I hope to contribute & aid different customers like its helped me. Good job. I'm still learning from you, as I'm trying to reach my goals. I absolutely love reading everything that is written on your website.Keep the information coming. I enjoyed it! Whats Happening i am new to this, I stumbled upon this I have discovered It positively useful and it has helped me out loads. I am hoping to give a contribution & assist different customers like its aided me. Good job. whoah this weblog is excellent i really like studying your posts. Keep up the good work! You realize, lots of individuals are looking round for this info, you can aid them greatly. What i do not realize is in reality how you're not really much more smartly-favored than you might be now. You're so intelligent. You realize thus considerably relating to this topic, made me in my opinion believe it from numerous numerous angles. Its like women and men aren't interested until it¡¦s one thing to do with Woman gaga! Your personal stuffs great. At all times care for it up! you are in point of fact a just right webmaster. The web site loading velocity is incredible. It kind of feels that you are doing any unique trick. Also, The contents are masterpiece. you have done a excellent activity in this subject! fantastic issues altogether, you simply received a emblem new reader. What may you recommend about your publish that you simply made some days in the past? Any positive? I have to express appreciation to the writer for rescuing me from this particular situation. Just after researching throughout the world-wide-web and obtaining methods which were not beneficial, I figured my life was gone. Living minus the answers to the issues you have resolved all through this article content is a crucial case, as well as the kind that could have in a negative way affected my entire career if I had not come across your website. Your actual knowledge and kindness in dealing with every item was invaluable. I'm not sure what I would've done if I hadn't come upon such a subject like this. I am able to at this point look ahead to my future. Thanks so much for your specialized and result oriented guide. I will not think twice to suggest the website to anyone who should have support about this problem. Just want to say your article is as astonishing. The clarity in your post is simply great and i could assume you're an expert on this subject. Well with your permission allow me to grab your RSS feed to keep up to date with forthcoming post. Thanks a million and please continue the gratifying work. I and also my friends have been following the excellent helpful tips found on your web blog then then got an awful suspicion I never expressed respect to the web blog owner for those techniques. All the people became for this reason joyful to see them and have extremely been having fun with these things. We appreciate you truly being well helpful as well as for choosing such excellent areas millions of individuals are really eager to be informed on. My very own honest regret for not expressing appreciation to you sooner. Great tremendous issues here. I am very satisfied to see your post. Thanks so much and i'm having a look ahead to touch you. Will you please drop me a e-mail? you're in reality a just right webmaster. The website loading pace is incredible. It seems that you are doing any unique trick. Moreover, The contents are masterpiece. you've done a magnificent job in this topic! Thank you for your entire efforts on this website. My mother really loves getting into internet research and it's really easy to see why. Most of us hear all regarding the dynamic mode you convey informative guidelines via your blog and even inspire participation from visitors on the theme plus my princess is now learning a great deal. Take pleasure in the rest of the new year. You are conducting a stunning job. I just want to mention I am just new to blogs and actually liked you're website. Probably I’m planning to bookmark your blog post . You surely have fabulous articles and reviews. Cheers for sharing with us your web page. I am now not certain where you're getting your information, however good topic. I must spend a while finding out more or understanding more. Thanks for fantastic information I was in search of this info for my mission. Hello there. I found your blog by way of Google at the same time as searching for a comparable subject, your web site got here up. It appears to be great. I've bookmarked it in my google bookmarks to come back then. Hello there, I discovered your blog via Google whilst searching for a comparable subject, your website came up, it appears good. I've bookmarked it in my google bookmarks. Hi there. I found your blog via Google while searching for a similar subject, your website got here up. It seems good. I've bookmarked it in my google bookmarks to come back then. Hiya, I am really glad I have found this info. Today bloggers publish only about gossip and web stuff and this is really irritating. A good blog with interesting content, this is what I need. Thank you for making this web-site, and I'll be visiting again. Do you do newsletters by email? Hi there. I discovered your website by the use of Google whilst looking for a comparable subject, your site came up. It appears to be good. I've bookmarked it in my google bookmarks to visit then. Hi there. I found your web site by the use of Google whilst searching for a related matter, your site got here up. It appears good. I've bookmarked it in my google bookmarks to visit then. Hello there. I found your web site by means of Google at the same time as searching for a similar matter, your web site got here up. It seems great. I've bookmarked it in my google bookmarks to come back then. Hi there. I found your site via Google whilst looking for a similar topic, your website got here up. It seems good. I have bookmarked it in my google bookmarks to visit then. whoah this weblog is wonderful i love reading your posts. Keep up the good work! You know, many individuals are hunting round for this information, you can help them greatly. Hiya, I am really glad I have found this information. Nowadays bloggers publish just about gossip and web stuff and this is actually annoying. A good blog with interesting content, that's what I need. Thank you for making this website, and I'll be visiting again. Do you do newsletters by email? Hey there. I found your web site by way of Google at the same time as searching for a comparable matter, your site came up. It seems great. I have bookmarked it in my google bookmarks to visit then. Hey there. I found your site by means of Google while looking for a comparable matter, your website came up. It seems good. I have bookmarked it in my google bookmarks to visit then. Hello there. I found your blog by means of Google whilst searching for a related topic, your web site came up. It appears good. I've bookmarked it in my google bookmarks to visit then. Hi there. I discovered your website by the use of Google whilst looking for a similar subject, your site came up. It seems great. I've bookmarked it in my google bookmarks to come back then. Hi there. I discovered your web site by the use of Google whilst searching for a related matter, your website got here up. It seems great. I have bookmarked it in my google bookmarks to come back then. Hey there. I found your site via Google even as looking for a related topic, your web site got here up. It seems to be great. I have bookmarked it in my google bookmarks to come back then. Hi there. I found your web site by way of Google whilst searching for a related topic, your website came up. It seems to be good. I've bookmarked it in my google bookmarks to visit then. Hey there. I found your website via Google while searching for a comparable subject, your site got here up. It appears good. I've bookmarked it in my google bookmarks to visit then. Hi there. I discovered your blog by the use of Google even as searching for a comparable matter, your site came up. It looks good. I've bookmarked it in my google bookmarks to visit then. Hi there. I found your blog by way of Google at the same time as searching for a similar matter, your web site came up. It appears great. I have bookmarked it in my google bookmarks to come back then. Hiya, I am really glad I have found this information. Today bloggers publish only about gossip and net stuff and this is actually frustrating. A good blog with interesting content, that is what I need. Thank you for making this site, and I'll be visiting again. Do you do newsletters by email? Hello there. I discovered your site by the use of Google even as searching for a comparable topic, your site came up. It looks great. I have bookmarked it in my google bookmarks to visit then. Hello there. I discovered your web site via Google whilst searching for a comparable subject, your web site came up. It appears to be great. I have bookmarked it in my google bookmarks to come back then. Hiya, I'm really glad I have found this information. Nowadays bloggers publish just about gossip and net stuff and this is really frustrating. A good website with interesting content, this is what I need. Thank you for making this site, and I'll be visiting again. Do you do newsletters by email? Hiya, I am really glad I have found this information. Today bloggers publish only about gossip and internet stuff and this is really annoying. A good website with exciting content, that's what I need. Thank you for making this site, and I'll be visiting again. Do you do newsletters by email? I¡¦ve been exploring for a little bit for any high-quality articles or weblog posts in this sort of area . Exploring in Yahoo I at last stumbled upon this web site. Reading this info So i am happy to exhibit that I've a very just right uncanny feeling I came upon exactly what I needed. I most without a doubt will make sure to do not disregard this site and give it a look on a relentless basis. Hiya, I'm really glad I've found this information. Nowadays bloggers publish only about gossip and web stuff and this is really frustrating. A good web site with interesting content, this is what I need. Thank you for making this web site, and I will be visiting again. Do you do newsletters by email? Hey there. I found your web site by the use of Google whilst searching for a comparable topic, your website came up. It seems to be good. I've bookmarked it in my google bookmarks to visit then. Hiya, I am really glad I have found this information. Nowadays bloggers publish only about gossip and net stuff and this is really annoying. A good website with interesting content, this is what I need. Thank you for making this web site, and I'll be visiting again. Do you do newsletters by email? Hiya, I'm really glad I've found this information. Today bloggers publish just about gossip and net stuff and this is really irritating. A good website with interesting content, this is what I need. Thank you for making this web site, and I'll be visiting again. Do you do newsletters by email? Hi there. I found your web site by means of Google whilst looking for a comparable subject, your website came up. It appears to be good. I have bookmarked it in my google bookmarks to come back then. Hello there. I discovered your site by means of Google whilst looking for a related matter, your site came up. It seems to be great. I've bookmarked it in my google bookmarks to come back then. Hey there. I discovered your blog by way of Google even as looking for a related matter, your web site came up. It seems great. I've bookmarked it in my google bookmarks to visit then. Hiya, I'm really glad I've found this information. Nowadays bloggers publish just about gossip and internet stuff and this is really frustrating. A good site with exciting content, this is what I need. Thank you for making this web-site, and I'll be visiting again. Do you do newsletters by email? Hiya, I'm really glad I've found this information. Today bloggers publish just about gossip and web stuff and this is actually irritating. A good website with interesting content, that is what I need. Thank you for making this web-site, and I'll be visiting again. Do you do newsletters by email? Hi there. I found your web site via Google even as looking for a related matter, your web site got here up. It appears great. I have bookmarked it in my google bookmarks to come back then. Hello there. I found your web site by means of Google while looking for a related topic, your website came up. It seems good. I have bookmarked it in my google bookmarks to come back then. Hello there. I discovered your blog by means of Google whilst looking for a comparable topic, your website got here up. It seems to be great. I have bookmarked it in my google bookmarks to come back then. Hi there. I found your site by the use of Google even as searching for a comparable subject, your site got here up. It appears good. I have bookmarked it in my google bookmarks to visit then. Hiya, I'm really glad I have found this info. Nowadays bloggers publish just about gossip and net stuff and this is actually frustrating. A good website with exciting content, that is what I need. Thank you for making this web-site, and I will be visiting again. Do you do newsletters by email? Hey there. I found your site by means of Google even as searching for a comparable topic, your web site got here up. It looks great. I've bookmarked it in my google bookmarks to come back then. Hiya, I am really glad I have found this info. Nowadays bloggers publish just about gossip and web stuff and this is actually annoying. A good web site with interesting content, that is what I need. Thank you for making this website, and I will be visiting again. Do you do newsletters by email? Hello there. I found your blog by the use of Google even as searching for a similar topic, your web site came up. It looks good. I've bookmarked it in my google bookmarks to visit then. hello there and thank you for your info – I have definitely picked up something new from right here. I did however expertise a few technical points using this website, since I experienced to reload the site lots of times previous to I could get it to load properly. I had been wondering if your web host is OK? Not that I am complaining, but slow loading instances times will often affect your placement in google and could damage your high quality score if advertising and marketing with Adwords. Well I am adding this RSS to my e-mail and can look out for much more of your respective fascinating content. Make sure you update this again soon.. Thanks for another excellent post. Where else may just anybody get that kind of information in such an ideal manner of writing? I have a presentation subsequent week, and I'm on the look for such information. I enjoy you because of your whole hard work on this website. My mom loves managing investigation and it's easy to see why. My spouse and i notice all of the powerful form you provide valuable techniques by means of this web site and inspire participation from others on this theme and our favorite child is really starting to learn a lot of things. Have fun with the remaining portion of the year. You're the one performing a very good job. Hey there. I discovered your web site by means of Google even as searching for a comparable topic, your site came up. It appears to be good. I've bookmarked it in my google bookmarks to visit then. Hey there. I discovered your web site via Google while looking for a comparable topic, your web site got here up. It appears to be great. I have bookmarked it in my google bookmarks to visit then. Hey there. I discovered your site by the use of Google whilst looking for a comparable topic, your web site got here up. It seems to be great. I have bookmarked it in my google bookmarks to visit then. You really make it seem so easy together with your presentation but I find this topic to be actually one thing that I believe I'd never understand. It seems too complex and very wide for me. I'm having a look forward on your subsequent post, I¡¦ll attempt to get the grasp of it! Hey there. I found your website by way of Google at the same time as looking for a comparable topic, your website got here up. It appears to be good. I've bookmarked it in my google bookmarks to come back then. Hello there. I discovered your site via Google while searching for a related subject, your web site came up. It appears to be great. I've bookmarked it in my google bookmarks to come back then. Hey there. I discovered your website by means of Google while looking for a comparable subject, your website came up. It seems great. I've bookmarked it in my google bookmarks to come back then. Hello there. I found your blog by way of Google whilst searching for a comparable matter, your web site came up. It seems great. I have bookmarked it in my google bookmarks to visit then. Hello there. I found your blog by way of Google at the same time as looking for a related topic, your website got here up. It appears good. I have bookmarked it in my google bookmarks to come back then. Hi there. I discovered your web site by way of Google at the same time as searching for a related subject, your web site came up. It seems great. I have bookmarked it in my google bookmarks to visit then. Hi there. I found your website by the use of Google while looking for a related topic, your website came up. It appears to be good. I've bookmarked it in my google bookmarks to visit then. Hiya, I'm really glad I have found this info. Today bloggers publish only about gossip and web stuff and this is actually irritating. A good website with interesting content, that is what I need. Thank you for making this web-site, and I will be visiting again. Do you do newsletters by email? Hello there. I found your website via Google whilst looking for a comparable matter, your website came up. It looks good. I have bookmarked it in my google bookmarks to come back then. Hello there. I found your site by the use of Google whilst looking for a comparable subject, your website came up. It seems good. I've bookmarked it in my google bookmarks to visit then. Hiya, I'm really glad I've found this info. Today bloggers publish just about gossip and web stuff and this is actually irritating. A good blog with exciting content, that is what I need. Thank you for making this web-site, and I'll be visiting again. Do you do newsletters by email? Hello there. I found your site by the use of Google while searching for a similar matter, your site came up. It seems to be good. I've bookmarked it in my google bookmarks to visit then. Hey there. I found your blog by the use of Google even as looking for a related subject, your website got here up. It appears good. I've bookmarked it in my google bookmarks to visit then. Hiya, I am really glad I have found this information. Nowadays bloggers publish just about gossip and web stuff and this is actually irritating. A good web site with interesting content, this is what I need. Thank you for making this website, and I'll be visiting again. Do you do newsletters by email? Hello there. I discovered your web site by means of Google at the same time as searching for a related topic, your site got here up. It seems good. I have bookmarked it in my google bookmarks to come back then. Hello there. I found your web site by the use of Google whilst looking for a similar matter, your website came up. It appears to be great. I have bookmarked it in my google bookmarks to come back then. Hiya, I am really glad I've found this information. Nowadays bloggers publish just about gossip and web stuff and this is really irritating. A good website with interesting content, that's what I need. Thank you for making this site, and I'll be visiting again. Do you do newsletters by email? Hiya, I'm really glad I have found this information. Nowadays bloggers publish only about gossip and net stuff and this is really irritating. A good website with exciting content, that is what I need. Thank you for making this web-site, and I will be visiting again. Do you do newsletters by email? Hello there. I found your site by way of Google at the same time as looking for a similar topic, your site got here up. It appears to be great. I have bookmarked it in my google bookmarks to come back then. Hello there. I found your site by way of Google whilst searching for a similar matter, your website came up. It appears to be good. I have bookmarked it in my google bookmarks to come back then. Hiya, I am really glad I have found this information. Today bloggers publish only about gossip and web stuff and this is actually annoying. A good website with exciting content, this is what I need. Thank you for making this web-site, and I will be visiting again. Do you do newsletters by email? Hello there. I discovered your website by means of Google even as searching for a comparable subject, your site came up. It seems good. I've bookmarked it in my google bookmarks to come back then. Hi there. I found your site by means of Google at the same time as looking for a comparable subject, your site came up. It looks good. I've bookmarked it in my google bookmarks to come back then. Hiya, I'm really glad I have found this info. Nowadays bloggers publish only about gossip and net stuff and this is actually annoying. A good web site with exciting content, that's what I need. Thank you for making this site, and I'll be visiting again. Do you do newsletters by email? Hiya, I am really glad I've found this info. Nowadays bloggers publish only about gossip and net stuff and this is actually irritating. A good site with interesting content, that's what I need. Thank you for making this website, and I will be visiting again. Do you do newsletters by email? Hiya, I'm really glad I have found this info. Today bloggers publish only about gossip and web stuff and this is actually irritating. A good site with exciting content, this is what I need. Thank you for making this web site, and I'll be visiting again. Do you do newsletters by email? Hiya, I am really glad I have found this info. Today bloggers publish only about gossip and net stuff and this is really irritating. A good website with interesting content, this is what I need. Thank you for making this site, and I'll be visiting again. Do you do newsletters by email? Hello there. I found your blog by means of Google while searching for a related topic, your site came up. It seems good. I've bookmarked it in my google bookmarks to come back then. Hey there. I found your site by way of Google at the same time as searching for a related topic, your website got here up. It appears to be great. I have bookmarked it in my google bookmarks to visit then. Hiya, I am really glad I've found this information. Nowadays bloggers publish just about gossip and internet stuff and this is actually irritating. A good web site with interesting content, that is what I need. Thank you for making this web site, and I will be visiting again. Do you do newsletters by email? I have been surfing on-line more than 3 hours as of late, yet I never discovered any attention-grabbing article like yours. It¡¦s pretty price enough for me. In my view, if all webmasters and bloggers made good content material as you did, the internet might be a lot more useful than ever before. Hello there. I discovered your website by way of Google while looking for a related matter, your site came up. It appears good. I've bookmarked it in my google bookmarks to visit then. Hiya, I'm really glad I have found this information. Today bloggers publish only about gossip and net stuff and this is actually frustrating. A good blog with exciting content, this is what I need. Thanks for making this website, and I'll be visiting again. Do you do newsletters by email? Hey there. I discovered your website by way of Google whilst searching for a related matter, your site got here up. It seems great. I've bookmarked it in my google bookmarks to come back then. Hi there. I found your site by way of Google whilst looking for a similar matter, your web site got here up. It seems great. I have bookmarked it in my google bookmarks to visit then. Hiya, I am really glad I have found this info. Today bloggers publish just about gossip and web stuff and this is actually annoying. A good website with exciting content, that's what I need. Thank you for making this site, and I will be visiting again. Do you do newsletters by email? Hiya, I'm really glad I've found this info. Today bloggers publish only about gossip and internet stuff and this is really irritating. A good site with exciting content, this is what I need. Thank you for making this website, and I'll be visiting again. Do you do newsletters by email? Hiya, I'm really glad I have found this information. Today bloggers publish just about gossip and web stuff and this is actually annoying. A good web site with interesting content, that is what I need. Thank you for making this site, and I'll be visiting again. Do you do newsletters by email? Hello there. I found your site by means of Google while looking for a similar matter, your website got here up. It appears great. I've bookmarked it in my google bookmarks to visit then. Hello there. I found your website by means of Google while looking for a similar topic, your website came up. It appears good. I've bookmarked it in my google bookmarks to visit then. Hi there. I found your blog by means of Google whilst searching for a similar matter, your web site got here up. It appears to be good. I've bookmarked it in my google bookmarks to visit then. Hi there. I discovered your web site by way of Google at the same time as looking for a similar matter, your website got here up. It looks good. I have bookmarked it in my google bookmarks to visit then. Hey there. I discovered your site via Google at the same time as searching for a related topic, your website got here up. It appears to be good. I've bookmarked it in my google bookmarks to visit then. Hi there. I found your site by way of Google whilst looking for a related matter, your site got here up. It appears to be good. I have bookmarked it in my google bookmarks to visit then. Hiya, I'm really glad I have found this info. Nowadays bloggers publish only about gossip and net stuff and this is really annoying. A good blog with exciting content, that is what I need. Thank you for making this site, and I will be visiting again. Do you do newsletters by email? Hi there. I discovered your web site by way of Google even as looking for a related topic, your web site got here up. It appears to be good. I've bookmarked it in my google bookmarks to come back then. Wow! This could be one particular of the most useful blogs We have ever arrive across on this subject. Basically Magnificent. I'm also an expert in this topic therefore I can understand your hard work. Great amazing issues here. I¡¦m very happy to see your article. Thank you so much and i am taking a look ahead to touch you. Will you please drop me a e-mail? Hi there. I found your web site by way of Google even as searching for a similar subject, your web site got here up. It seems great. I have bookmarked it in my google bookmarks to visit then. Hi there. I discovered your site via Google at the same time as searching for a comparable matter, your web site came up. It appears good. I've bookmarked it in my google bookmarks to visit then. Hiya, I am really glad I've found this information. Nowadays bloggers publish just about gossip and internet stuff and this is really annoying. A good website with interesting content, this is what I need. Thank you for making this website, and I'll be visiting again. Do you do newsletters by email? Hey there. I found your web site by way of Google while looking for a similar matter, your site came up. It appears great. I've bookmarked it in my google bookmarks to come back then. Hey there. I found your website by means of Google whilst looking for a comparable topic, your site came up. It appears good. I've bookmarked it in my google bookmarks to come back then. Hello there. I discovered your web site by means of Google at the same time as looking for a related matter, your web site came up. It appears good. I have bookmarked it in my google bookmarks to visit then. Hi there. I found your blog by the use of Google whilst searching for a comparable matter, your web site came up. It appears good. I have bookmarked it in my google bookmarks to come back then. Hi there. I discovered your blog by way of Google while looking for a similar topic, your web site got here up. It seems to be good. I have bookmarked it in my google bookmarks to visit then. Hi there. I discovered your website by means of Google even as looking for a related topic, your site got here up. It seems to be good. I've bookmarked it in my google bookmarks to come back then. Hi there. I discovered your website via Google even as looking for a related subject, your web site got here up. It looks great. I have bookmarked it in my google bookmarks to come back then. Hiya, I am really glad I've found this info. Nowadays bloggers publish only about gossip and web stuff and this is really irritating. A good website with exciting content, this is what I need. Thank you for making this web-site, and I will be visiting again. Do you do newsletters by email? I’m impressed, I have to admit. Seldom do I come across a blog that’s both equally educative and interesting, and let me tell you, you’ve hit the nail on the head. The problem is something too few men and women are speaking intelligently about. I’m very happy that I came across this during my search for something relating to this. Hi my family member! I wish to say that this article is awesome, great written and come with almost all significant infos. I¡¦d like to peer extra posts like this . I'm still learning from you, while I'm improving myself. I certainly love reading all that is posted on your site.Keep the posts coming. I enjoyed it! I do agree with all of the ideas you've offered in your post. They are really convincing and can definitely work. Still, the posts are too quick for newbies. Could you please lengthen them a little from next time? Thank you for the post. You actually make it appear really easy along with your presentation but I to find this topic to be really one thing that I feel I might never understand. It kind of feels too complex and very large for me. I'm having a look ahead to your subsequent publish, I will try to get the grasp of it!